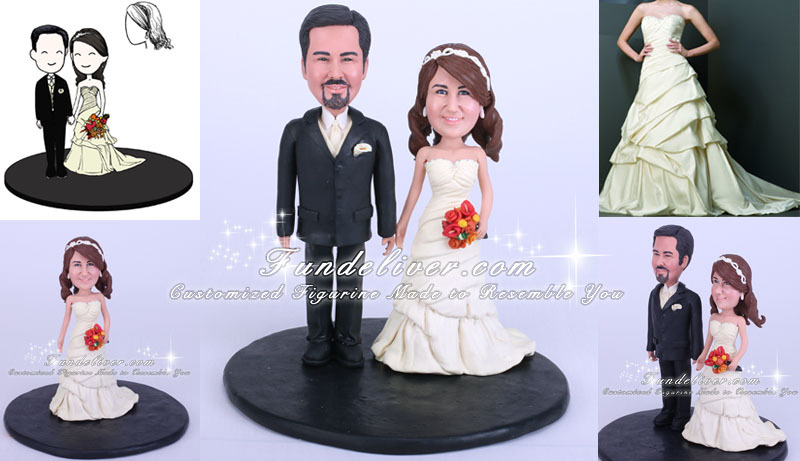 This is a completely customized interchangeable wedding cake topper ordered by one of our customers. They plan to use their own figurines of a boxer and black Labrador which measure between 3 1/2 and 4 inches in height, so they want to order a interchangeable bride and groom cake topper proportionate to the dog figurines? For the bride, she is in an ivory dress as above image. Groom is in black tux with ivory colored vest and tie. They do not want a background, but would like a round black base. We made the base larger than normal since we have to leave enough room for boxer and Labrador figurines. 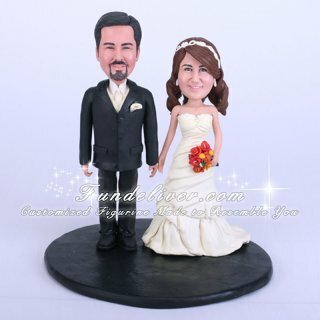 Also the bride and groom figurines are interchangeable and moveable, just in case they want to redispose the layout. How do you think about these interchangeable cake toppers, love them?